Tapes/CD's are now available for sale from Sound Word! Each of the 7 conference sessions are available individually (the speakers and topics are listed), or as a set. "Question and Answer" - Everyone answered questions collected earlier in the day. I personally don't remember too many of the comments; others will have to help if you want this fleshed out more. "Scheduling 1" - Lynn gave very specific advice on planning a schedule while focusing on priorities consistent with a CM philosophy (such as unscheduled time, plenty of fresh air and water). Karen said she doesn't use a schedule and then went on to explain her method of assigning work and letting the student organize his own day. "Scheduling 2" - Donna-Jean spoke on the importance of consistently making a small amount of time for the things we want our children to relate to (passions)-- art, music, nature, etc. Wendi spoke about each family finding its own schedule and about being flexible to change that schedule as often as needed (and, as she herself admitted, she spoke on this with her own notes all jumbled out of order!). "An Atmosphere and a Life" - Donna-Jean focused on trusting the Lord, leaning on Him during life's struggles. Lynn said she wanted to point out the benefits of a CM education. She painted a thrilling picture of the rich life we can give our families through following CM. "Charlotte Mason Dramatization" - Miss Mason (aka Donna-Jean) herself shared from her vast store of wisdom in this talk. Included on this are the Sacred Harp songs performed live at the conference. This CD and the "Atmosphere and Life" CD would be great for those considering home education and/or CM. "Introduction and History" - This is your only chance to "meet" Leslie through the audio experience (except for brief comments from her during the Q & A session). :) The text is available online, but not her sweet voice. If I had to choose some to purchase, I think I'd try to get at least one message from each of the Advisory ladies. Listening to each share her own heartfelt ideas brought to life my understanding of this AmblesideOnline family. Some Elements of Charlotte Mason - 43 mn. Question & Answer - 38 mn. Scheduling 1 - 34 min. Scheduling 2 - 42 mn. An Atmosphere and a Life - 58 min. Leslie Noelani has created a conference pictorial and narration from an Advisory member's perspective. Colleen in Wis highlighted some of the talks and gave a thorough report about our special guest speaker. Her comments are here. (Katie took lots of detailed notes from the conference speakers! You can read them here, or on her blog in parts one and two. The AmblesideOnline conference weekend was a bit of a magic-carpet experience for me. It was as if I were whisked away from my ordinary routine of "Did you get those math pages finished?" and "Who left the milk on the counter this time?" into an Alice-in-Wonderland kind of world where I met larger-then-life characters, and it all still seemed sort of natural, but wasn't really. In the Wizard of Oz film, Dorothy meets a lot of people who are really familiar to her, but they have become something dramatic and fantastic. I did know all the Advisory members before, but a Texas accent, glasses, a gorgeous tan, and AWFUL-ly long hair just don't generally manifest themselves in email conversations. So, it was as if all the people I knew in "black and white" suddenly burst into Technicolor. It was really wonderful, actually. In my own little Wonderland, I got to hug Wendi, laugh with Donna-Jean, chase babies with Leslie Noelani, count T-shirt orders with Leslie S., and sit at Lynn's table drinking coffee and eating chocolate. I wouldn't have been able to imagine such things could happen in real life, so I must have been whisked off on that magic carpet, or fallen down a rabbit hole, or something. I will never, never, never forget standing next to the Advisory members and singing hymns. All the effort it took to make this visit and conference happen would have been worth it for just that moment. Actually, there were many hugs, and much, much laughter, and even a few tears. In one classic "this-is-how-the-Advisory-works-together" moment, we needed to do something on the computer. We were using Lynn's computer, and Leslie N. was dictating what needed to be done, but my fingers were doing the work, because I was familiar with a track-pad. Everyone was doing what they could to make something happen, that might not have gotten done, otherwise. I know the event couldn't have had the same magic-carpet interlude feeling to Lynn, because she had all the details of the conference to take care of, and we were, after all, quite a few house guests, for whom pillows and towels and breakfast must be found. But that is how it felt to me, and I haven't quite recovered from it yet. I think...I hope...that maybe I never altogether will. The conference itself was truly awesome. I can remember when we wondered if as many as 25 or 50 people would want to try out the curriculum we had put together, and now here were over 150 people gathered in one place, representing only a fraction of those who would have liked to be there. Their voices singing those hymns just filled the building, and it was amazing to think that Leslie's, "I have an idea" had come so far and touched so many lives. It was wonderful to meet people face-to-face that I have known through email for years. It was extra-wonderful to hear real AmblesideOnline moms talk about using the curriculum in their homes. I live overseas, and actually have very limited real-life contact with homeschoolers, and until this weekend, I had never met anyone who was actually using AO in their homes. It was humbling, and reassuring, and, unfortunately, I just don't think there are enough great words to say how truly fabulous the whole experience was. I was inspired; I was uplifted; I was blessed beyond anything I could possibly imagine. I had been preoccupied before the conference with my own speaking obligations. What was I going to say? Somehow, it actually had escaped my attention that I was also going to be hearing and listening to the rest of the Advisory speak. Even when I saw them going over their notes for the conference, it didn't strike me. I was too busy thinking about MY notes. Not until I was actually in the auditorium listening, early in the day, did I finally wake up to the fact that I was going to receive so much more than I could ever give. My only regret about the entire event was that Anne was not physically present, although she was there in spirit, and we called her a couple of times on the telephone. Having met the rest of the Advisory in person, I don't think I will be satisfied until I get to meet Anne and give her a hug, too. Ladies, you are awesome, and I love every one of you. My memories of this visit will be some of the most treasured. It was truly a little taste of heaven on earth. And did I mention that, before the day was even over, Leslie said it again? "I have an idea..."
My family has been blessed by this conference and I just want to thank all of the people who worked together to pull it off. I can't say "Thank you" enough! Donna-Jean made me cry, Wendi made me smile, Lynn made me laugh, everyone contributed something worthy of writing down and thinking about. You all covered the basics, but even in that, there was plenty more to learn and ponder. [My daughter took a liking to Leslie and talked about her] ALL THE WAY HOME!! . . . She loved hearing the history of AmblesideOnline. My husband was so impressed with Lynn and her daughters. He also loved Donna-Jean's performance as CM. He said he still feels a little in the dark about what we are actually doing, so he is going to read through the website and some of the things I've printed out. I'm so glad that he is getting more of an understanding of what we are doing. He's always been supportive, but now he is even more so. Thank you, ladies, for all you do. It started out where Lynn came out introducing some friends of hers that were going to help her out a little bit with different sessions. And on our way to the conference while we were in the car, I overheard Mama talking about a special guest but they wouldn't tell who. I said, "Is it Charlotte Mason?" But Mama said, "That really would be a surprise, Samantha, since she's dead!" But it turned out I was right! And I think Donna-Jean did quite a good job! And I enjoyed hearing Leslie's story of how AmblesideOnline got started. People were very impressed with Mama's schedule book and our photo album. And I really enjoyed looking at the nature notebooks. Most of them were very well-drawn, better than I could do! Leslie Noelani's Note - I met Samantha and Nathan in the nursery, and Samantha is right, he did look pretty adorable playing with the toys! I'm sure she would love to hear some feedback about her narration! The conference was very uplifting. The Advisory ladies were definitely an inspiration. I would love to be able to go to another conference!!! Seeing visual results from their beautiful and very talented daughters was moving. Several times during the conference I kept thinking to myself...."can I just send my kids to any of their houses to get an education?" There were many ideas of how to do things. Narration, which has worried me, was talked about in good detail. I think the main reason I went to the conference was to see ladies who have used this curriculum with great success. Being from a public school background, I have been afraid to let go from the "norm" and do what is best for my children. AmblesideOnline has always called to my heart. After hearing from others that it is possible.....maybe I can just step out in faith. Thanks to everyone for their hard work.......the conference was worth every hour and every penny. I am still in thinking mode about the wonderful conference on Saturday. Lynn, you showed everyone what true Texas hospitiality is all about. Holy, Holy, Holy (my favorite hymn from BSF days) was so uplifting I could have gone home then. Donna-Jean reminded me to give thanks to my parents for their hard work. Leslie showed me that one little question, presented to the right people can change the world. Wendi helped remind me that it is my three precious ones who are the most important. (not that load of laundry on the couch). Karen showed this former public school teacher how narration is the means to the prize. Thank you all from the bottom of my heart for giving of yourselves. Thank you to your husbands and families who sacrificed their beloved to allow each of us to experience this family changing experience. Thank you to the church who gave generously to increase the kingdom of heaven. When I looked around the room on Saturday I realized that we are all just moms (and dads) who are united in our desire to give our children the best education that we can. It does not matter if we are tall or short; brunette or blond (or somewhere in between); Protestant or Catholic; Republican or Democrat; one child or seven children; city dwellers or country dwellers. 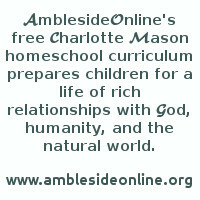 Charlotte Mason and Amblesideonline allows for all of this. To me this is the beauty of CM. I am looking forward to the next 16 years of homeschooling now with a passion that had died somewhere between the 5th load of laundry and the last dirty diaper. You can read more on my blog. Peace and God's never ending love to you all. "Enjoy your children" - "Revel in the beauty of all that God has given us, even by us, through music, art, poetry, good books" - "Take time." - "Appreciate." - "Hope" - "Keep the vision." I hadn't really known what to expect. I have used AmblesideOnline for over 3 years, so I didn't think that I would learn much new. I DID glean many helpful tips, but overall it was my spirit and soul that were fed, and most in need of being fed. I feel greatly inspired to be less concerned about my "get things done" list and more alive to all that really matters. Thanks so much to everyone who put the conference together. I truly could not have asked for more, and I am the idealistic type who tends to be disappointed! I wanted to let all of you of the Advisory know how very much it meant to me to attend this conference and soak in all that I did of your words of wisdom, encouragement, and tips. Your presentations were so informative. I could not get over how connected I felt to those in the room and those on stage. How we were all part of such a larger force and that we are all so blessed. Not only did it further my understanding of Charlotte Mason philosophy but I obtained so much insight into scheduling, using AmblesideOnline for multi-children, narration, art and composer studies, and on and on. For the first time, I so clearly saw the big picture which I had before only suspected existed of what using AmblesideOnline for a child's upbringing will mean. I cannot even imagine the countless hours the women of the Advisory spent on planning and preparing for this conference - not to mention the entire curriculum. I was the one in the audience (probably not the only one, I'm sure) who was wiping tears from her eyes throughout the whole day - not just from the moving moments in the presentations (of which there were many) but just in awe and gratitude of the incredible love, dedication, and energy of these women. I thank each one of you for all you have done and to your families for all the support and sacrifice they have given. I've come to realize that not only would my homeschooling be in jeopardy without AmblesideOnline, but so too would be lost this priceless vehicle in raising our children in such a meaningul way and connecting with them in such a way that I would never have independently achieved, without AmblesideOnline. The conference was phenomenal - I can hardly wait for my husband to hear the tape, too. I so wish I could go to church with all of you - live in a community with all of you at the conference. Thanks to all the attendees who also gave of themselves openly and candidly, the conference was lifted an unbelievable notch even higher. Also thanks to Andrea for opening your home to all of us - such a lovely, and spacious home - your children are so lucky to grow up in such a great environment - your hospitatlity was gracious and wonderful. I came away from the conference saying that if everyone - even 50% of our neighbors in the world - gave of themselves as you all have done - how different this world would be. Thank you so much. I am still in Texas visiting friends, and all we have done is talk about the conference. I know that all of us on the Advisory who could be there (we so missed Anne!) were blessed far beyond anything y'all got out of the conference. I was just so blessed by the outpouring of love. I tried to hug everybody's neck at least once, but there were just so many of you wonderful, wonderful moms (and a few wonderful husbands) that I couldn't get around. You have no idea how blessed we all were by the hugs.prayers, warm wishes, kind, kind, kind words, and the love. I will treasure this past Saturday for years!! That could sum the conference up for me, and it would be easier to stop there, for my sake. Each person attending the conference was blessed by the same ladies, and were blessed by the same words, but God works in each heart differently, as necessity brings forth the need. [Hmmmm, that sheds light upon the need to allow students to narrate what was important to each of them individually......... ] So, for those of you who were unable to come and were asking for narrations, I'll try to put some of the richness from this weekend into words too. It's not exactly in the form of 'this, then that', but most of the following came directly from the presentations this weekend. God was abundantly blessing over and over this weekend, and if you weren't there, don't be discouraged. Those blessings will still spread out and reach you. These new 'AOConference ripples' are merely following the first ripples which have been spreading out ever since Leslie and others first pressed forward with efforts to not only learn how to apply the wisdom of Charlotte Mason's philosophy and method in their own homes, but to also freely share their findings with anyone who was hungry for such guidance. Not only that, those ripples follow the ripples begun by early, modern homeschool pioneers who labored to bring Charlotte Mason's writings to us. And before that, there was the amazing discernment and ready application taught by Charlotte Mason herself. And before that, there were the great thinkers whom she so ably studied and learned from, such as Quintillian and Erasmus from ages past, and Gouin and Curwen from Miss Mason's own era. And before that, there was the incredible foundation of God, which was made to show forth His glory, and His plan for us, including natural law-- A law which shows us truth and wisdom, even in training and teaching our children. A law which truly shows us a natural and loving educational law and philosophy. God's word will not return void. His Truth and His Law will endure until heaven and earth pass away. (Matthew 6:18) There is a firm foundation for those who will seek the Truth, even in the training of our children, perhaps especially so: "Hinder not the children to come unto me" was an important message from Christ Himself. Charlotte Mason might not have found all of the natural law she sought, or understood all of what she found perfectly, but she did diligently seek Truth, and found much of it. Then she was afforded the opportunity to share her findings with the world. Thankfully, Leslie willingly submitted to share with us the history of AO. While she simply shared her precious heart, she bore witness to the bountiful provision of God, who established bit by bit, as He was sought, the wisdom and foresight (and God's indwelling Holy Spirit, no doubt) to enable her to draw together able hearted and minded women, who selflessly and diligently seek God's guidance to an end which is beyond our own understanding. It was beautiful to see Leslie's humble spirit, as she shared her heart's desires from the days before she intended to homeschool. Listening to the recounting of how God moved through her life circumstances to put a dream and desire in her heart to flesh out a rich way of life for her own precious children was inspiring. Those circumstances in Leslie's life have included the inability to provide private school education, access to early CM lists online, thus the opportunity to learn about CM in increasing depth, as well as lists of wonderful books, opportunity to meet other incredible women online, and somehow (and this boggles my mind), enough time and help to persevere. The results have not come to an end. The growth of AO, this beautiful phenomenon, is still occurring. More importantly, the fruit of AO is beginning to mature in some homes, and to blossom in others, and Lord willing, will continue to do so. It is beautiful to sit and ponder how the advisory pressed on bit by bit to sift the sands of time and understanding, and in the end, not only give guidance to the many who simply wanted more in their already rich lives, but also to offer hope to the hopeless, a hand up to the weary, and even more, a vision to a community of all of those various types of families to encourage each other and lift each other up. A community which is called away from that which is merely 'tradition' in order to learn more and more about Truth. It is exciting to bear witness as this presence of God grows. AO is not perfect, nor should it be. If it were, I'd have to leave, you know....... And that would bring an end to something beautiful for my own children's lives, and for my own. I'm quite certain that I'm not qualified to know what imperfections might exist...... =] Nor do I need to. I just fall on my knees before God and thank Him for the richness of his bounteous love for my children. While praying for the conference on Friday evening, the power of Psalms 107 bathed my soul, and awe filled my heart. The grace and power of God is seen clearly in His relationship with Israel in this beautiful Psalm. Yet what grabbed my heart was that in so many ways, the relationship between God and Israel is a picture of what He does for many of us individually. He provides so much for us in spite of who we are, and for our family, much of the godly provision in our children's lives is coming from AO. Gratitude is too small of a word. Before God finally saved my soul, all I can say is that I was blind and helpless, much like 'those who dwelt in darkness' who had 'rebelled against the Lord', whose heart 'stumbled with labor'. I knew who God was, and where I understood His truths, His natural law protected me from much that I could have brought upon myself, but my knowledge was hit and miss, so I brought a lot of trouble upon myself anyway. I could never be complete enough to remain steady for any length of time without His saving grace. After receiving Christ, there were many gaps of knowledge, and there still are. But where I stumble, He steadies me, and lifts me up, and sets me upon a foundation, and He lifts my head. Bit by bit, He is faithfully building up my family through His unerring Word. He delivered [me] out of [my] distresses. He led [me] also by a straight way. "Oh give thanks to the Lord, for He is good. From the north and from the south." And consider the lovingkindnesses of the Lord." These conference narrations are overwhelming to me. God indeed worked - and He worked in *my* heart, too, in ways I'm sifting through and praising Him for. And the tapes will bring deep and rich blessing that will continue. We'll work on them as quickly as we can, and let you know when they're available. All of those who didn't make it ~ GET THE TAPE!! Lorraine's experience with Holy, Holy, Holy was the same as mine. I don't think I got past the first set of Holies before I was moved to tears. There's something about a cappella singing that does that to me anyway, and then I could hear my oldest son and his wife, whom I'd traveled to the conference with, singing beside me. My heart just overflowed with thankfulness to the Holy, Holy, Holy One. Immediately following that, Charlotte herself came in to speak to us, and just HAD to quote Wordworth's . "trailing clouds of glory do we come/ From God who is our home:/ Heaven lies about us in our infancy" which is my favorite Wordsworth, actually maybe my favorite poem. There was my beautiful little granddaughter, just 10 weeks here from God, her home. I was done for at that point! The conference was everything I'd hope for, and maybe more. It's hard to imagine how it could have been any better. I am very thankful to the Advisory for making such an enormous effort to bring this about. When the announcement was first made, I felt amazement and thankfulness that it was to be right in my back yard, so to speak, being in the Dallas area (I live in East Texas). But, I met ladies who were there from CA (she had frequent flyer miles her husband encouraged her to use to come), WA (in tears because she was really THERE), and Georgia and Tennessee and Missouri. Amazing! Thanks to ALL who made it happen (I LOVED the show-and-tell tables. I stayed busy at breaks, feverishly writing down titles, authors, etc. to the resources displayed there). I will just say that I was there and I still intend to buy the tapes! I did get actual concrete ideas, but mostly I loved seeing (hearing) REAL women whose husbands laugh at them when they annouce that they will be teaching organization (ha!) and who have to call the daddies to ask that cheeseburgers be picked up for dinner. And these women had lovely, talented, teenaged children (we saw lots of them) who are coming out of homeschooling just beautifully! I want the tapes to listen to for those WHY AM I DOING THIS days <vbg> . So that would be a highlight for me. The inspiration of children who have been raised on this and are interesting to be around. The conference was AWESOME, AWESOME, AWESOME!! I was soooo blessed by the whole thing. I cried on the way home from the pizza party. I went to the conference feeling a bit overwhelmed and intimidated by AmblesideOnline. But I left with so much encouragement and joy about starting this for the first time this fall. I have been homeschooling for 7 years, but this is all new to me. Everything that I needed to hear I heard on Saturday. And what a great group of ladies that attended. Everyone was so friendly. I felt like I already knew everyone. I normally tend to be very shy in big groups and tend to stay by myself, but I couldn't get away with that in this group. I want to thank the advisory for all their hard work in putting this together. I was really impressed by the diversity of the advisory. I don't know why, but I had a preconceived idea that you all would look the same; kind of like librarians. Please forgive me for thinking that--you ALL are so different and I looove that. I think each one of you represent every woman out there. I also really appreciated all of you being so transparent. You really are REAL women. Thanks for sharing your lives with us. Most of all thanks for keeping the focus on Christ. Without him we can do nothing! I really feel like I can do this now. I love what was said about starting where your at and starting simple. I'm the kind of person that wants to go gangbusters and do it all overnight. Lynn Bruce---you really inspired me to learn Sacred Harp singing. I already connected with some ladies that are putting me on the right track. What beautiful harmony!! Any of you that couldn't attend I highly recommend the tapes. I can't wait to get my hands on a set of tapes myself. There was never any chance that I could make it to the conference due to many reasons and I was pretty much accepting of that. On the day of the conference I thought about all you fortunate, blessed people who were able to attend, with just a little bit of envy..... :) But after reading so many testimonies I feel almost like I was there. Many have referred to crying at various times during the conference and I was tearing up just reading about it! Thanks again, so much, to all the women of the Advisory for all you do to make AmblesideOnline what it is. After curriculum jumping a whole lot over the years I am so thankful I found CM and AO. I've told many people that once I discovered CM there was no turning back. And I am anxiously waiting to purchase tapes or cds. I just wanted to thank you all for the amazing amount of effort and inspiration that you shared with me (and 150 other home schoolers) last Saturday! I left feeling excited and confident having been greatly inspired by your stories of harvest and fruit! Thank you for your wisdom, your laughter, your dramatic interpretations (Donna-Jean, you were amazing! I actually feel like I might tackle Charlotte's writings now that I can 'hear' her voice speaking them! ), your voices, your little tips, your big tips, your history, your lives, your love and above all your God. My sister told me that someone once told her that if one is unable to have God as their ONLY motivation to homeschool then they shouldn't do it - and I appreciate you sharing your Faith and encouraging me along that same path. Blessings on you all and thank you again for giving so much of yourselves to make last Saturday happen.......it does not go unnoticed. Thank you for what we saw AND for what we didn't see......and for all that you continue to do. My take on the conference... words can't describe how it blessed me. I got some practical ideas (I came right home and ordered a copy of that beautiful Pilgrim's Progress.) and some conviction from words that spoke right to my heart. 1. Whatever your special circumstances are, they will change. And probably just when you get used to them. -LOL! This little bit of wisdom really struck me. We all have to do what works for us and keep being flexible. 3. We always aim high but don't let it be a burden. Think of the fancy, written schedule as "plan B". Remember the schedule is a means to a goal, not the goal itself. 4. If you have an ego problem with your children being better educated than you, then don't homeschool. 5. Be sure to always find time to tell your children the "big 3" I love you. I think you are wonderful. I'm so glad you are mine. 7. Where do I start? You just have to start where you are. 8. God is the Lord of the harvest. Do the little things consistently and lean on him to worry about the harvest. 9. Do the big things first so the little things fit in. (Illustration: If you pour sand into a jar, then pebbles, then little rocks, then big rocks, it won't all fit. If you put them in the same jar in the reverse order, they will all fit) So do math first in the day, if that is your big thing. Don't let your day get bogged down in little things like laundry and dishes without first doing the big goals for the day. 10. This one really touched me. Two Bible Verses: "The Joy of the Lord is my strength." "Paul thanked God and took courage." I can't do explaining what that means to me justice. Basically, when we run out of strength, just delighting in the Lord will give us strength. We don't thank God for our pain, but in our pain, we can thank God for just being who He is. No matter what, he's always there and loving us. Stop. Thank God for being who He is. Then take courage from that and continue on. I so badly needed to hear this. Ok that's that for now. I learned so much. I'm sure I didn't do any of that justice. It really spoke to me and that's the snippets I wrote down. I can't wait to relisten to it all on tape. I agree that the conference was wonderful! I enjoyed it very much and came away feeling very encouraged! Lynn -- I loved you and your daughters singing. I was wondering how to find out more about The Sacred Harp Singing? Thanks to all of the wonderful women and their families that took of their time to put on this conference. It was a refreshing and encouraging break! Donna C, Author, "Homeschooling Only One" gave a detailed description of the conference on her blog. You can read it here. Don't forget to take a look at Leslie Noelani's conference pictorial and narration.